The new generation Landis+Gyr Keypad Prepayment Sabre is a compact, single phase, two-wire, keypad-based prepayment electricity meter in a housing compatible with the ESKOM standard common base electricity dispenser socket. This meter is most suited to new reticulation and is directly and easily interchangeable with common base prepayment meters from other approved manufacturers using the common base configuration. 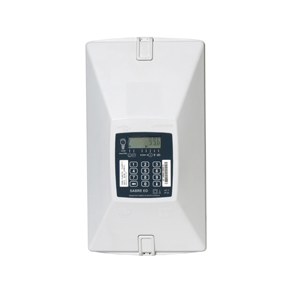 User interaction with the meter and access to meter information (such as a low credit warning, energy consumption and load contactor status) are available using the keypad and LCD display. Landis+Gyr Keypad Prepayment Sabre is mechanically sealed against tampering through the use of factory-sealed screw plugs on the rear panels and a utility-sealed wire seal on the front of the meter. The use of these mechanical seals ensures that there are visible signs of tampering if unauthorized entry to the system is attempted. While the standard Landis+Gyr Keypad Prepayment Sabre model does not have a mechanical anti-tamper facility fitted, meters with this facility are available on request. The tamper facility automatically detects if the meter is removed from the common base. This condition will set the tamper condition thereby opening the latching relay when the meter is re-fitted to the base.